1. Once you buy the plugin, you will get zip folder. By using the Documentor plugin, creating documentation is now very easy. You just need to put your data. Follow step by step process to create a document. 1. After successful activation of Documentor plugin, Documentor menu will appear on the dashboard of WordPress. 2. Head over Documentor menu and select Add new option. 3. Create New Guide page will get open, here specify your guide name and select settings set. If you have already created settings set, then you can inherit settings of previously created document else choose default settings. Click on create button. 4. Click on the “Add Section” button to add sections in the document. 5. 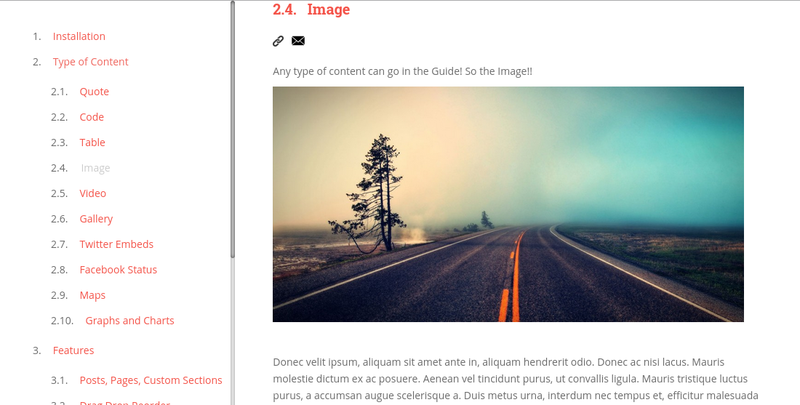 Using Add section, you can add your separate post for the document or you can add a post or pages which are created in WP posts/pages. You can also add links with a title. Inline: In the inline section, you can create your own posts which are usable in Documentor. You can add media files in the inline section e.g. images, videos and picture gallery. Posts: This section will display all posts which are created in the posts section of WordPress. 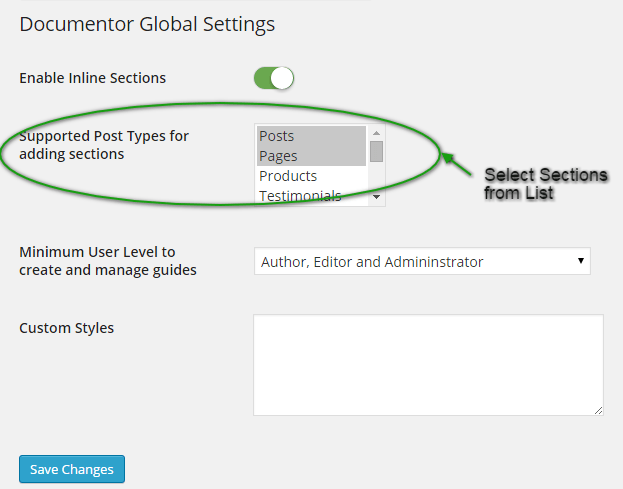 You just need to select or search posts and insert into Documentor. Pages: This section will display all pages which are created in the Pages section of WordPress. 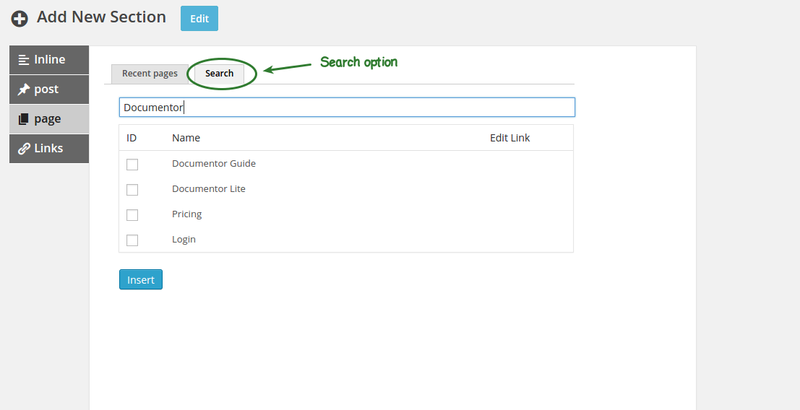 You just need to select or search Pages and insert into Documentor. Links: You can add external links into Documentor. To open the link into new tab/window enable below option “Open in new window”. Reorder: You can reorder sections just by dragging section and drop it wherever you want. Hit Save button after reorder completed. 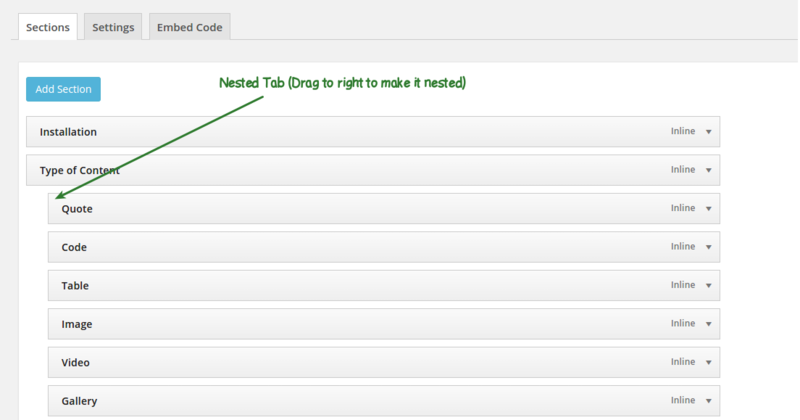 Nesting: Drag section slightly to right side to make it as a nested or sub-point. Hit Save button once nesting is completed. Edit: To Edit the section, click on the open icon (at the rightmost side after section type). The section will get open, where you can change Menu title and Section title. For content, change click on Edit link (above Menu title). Here you can change content of the section and update it after changes are done. Do not forget to save the changes. Delete: To remove the section, click on the open icon (at the rightmost side after section type). The section will get open, where you can find the “Remove” option to delete the particular section. Hit Save button once changes are done. 7. Now just copy the shortcode generated and Paste it on the page where you want to display the guide. You can find the shortcode as well as the template tag on the righthand side of the guide. 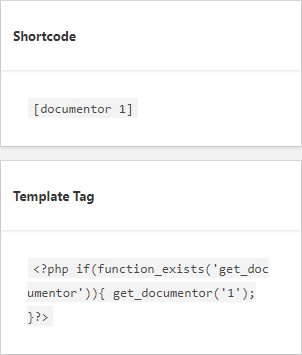 Manage page: In the Documentor menu go to the Manage option that will list the document in list view along with shortcode and template tags. Shortcode: Shortcode is a best and easy way to display the document on the frontend. 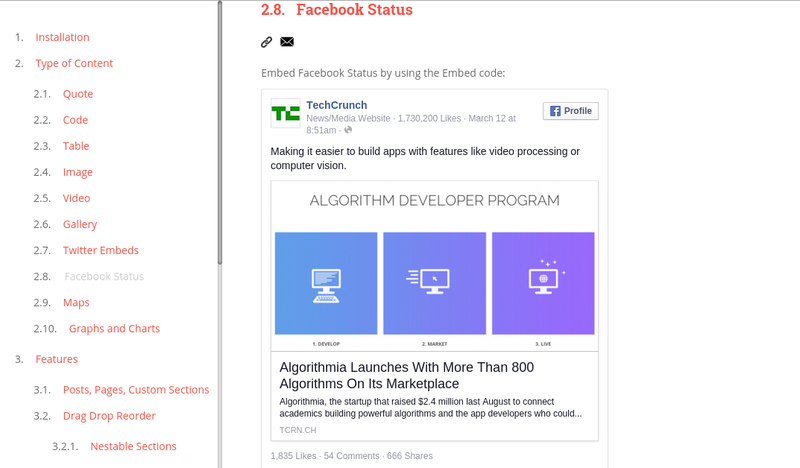 Use respective shortcode of the document in post/page to display the guide on particular post/page. Template Tag: Use template tag of the respective guide in the theme’s template file (e.g. page.php, single.php) to display the document on every post/page. Quick Tag: You can add Documentor in post/page by using Quick tag. The Quick tag option is not available in the latest Gutenberg Block Editor, but you can find the Quick tag option in the Classic Editor. 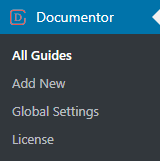 Create New: Besides creating a new guide from the Documentor menu from the left, one can also create a guide using this option. Import: One can easily import the document that is created on the localhost using this option. Choose the file that you want to import and the document gets imported easily. Basic Settings contains the following setting fields. This setting plays a vital role in the appearance of the document. Skin: Documentor has different skins such as bar, broad, cherry and mint. Choose the particular skin that suits your Website theme. Section Animation: You can set an animation to Documentor contents. While loading contents of Documentor you can experience the animation effects. Indexing Format: You can enable or disable indexing of document. Guide Title: If this option is enabled then it will display the name of the guide on the frontend. One can easily format the title of the guide from the different options that are present. Scrolling: After clicking on Menu title content get visible in scrolling effect. You can enable or disable it. Default scrolling option is ON. Fixed Menu: It specifies the location of the menu. Top Margin for Menu: It will specify the top margin for the menu. Menu Position: The position for the menu of a document can be selected from the drop-down. It can be either placed towards the left or right of the document. 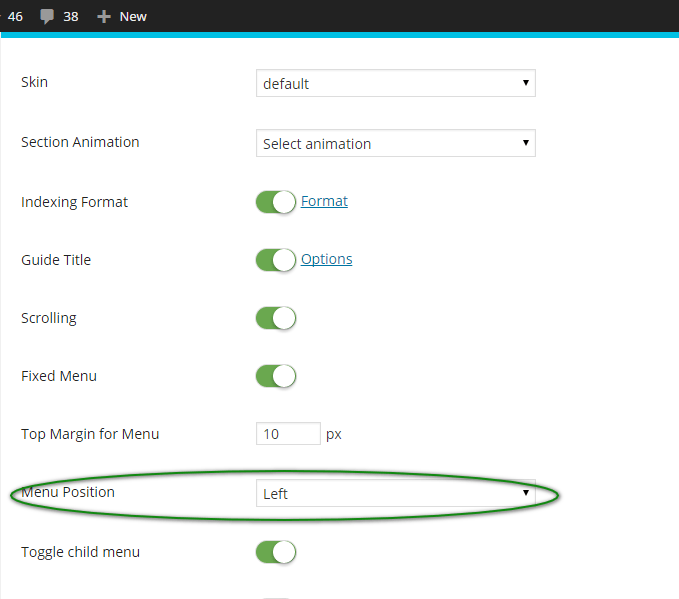 Toggle child menu: When Toggle child menu is enabled then instead of displaying the child section of the guide on the front end there will be a toggle menu displayed and when clicked, it will display the child menu. By default, it will be hidden. Extras on Section hover: When this option is enabled then it will not show the icons for each menu of the section unless you hover over it. You can change the font, font style, color, and font size or you can use the theme’s CSS with the help of the formatting option. 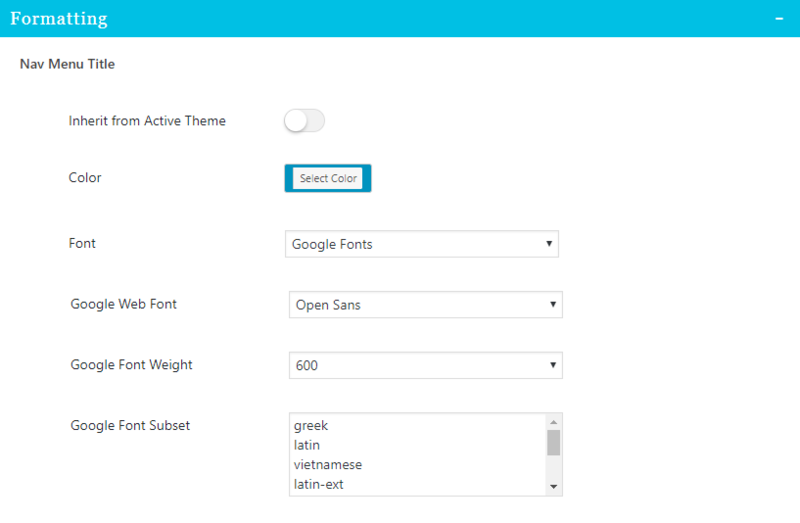 Use theme default: To use the theme’s CSS to Nav Menu Title, you can keep option enable. 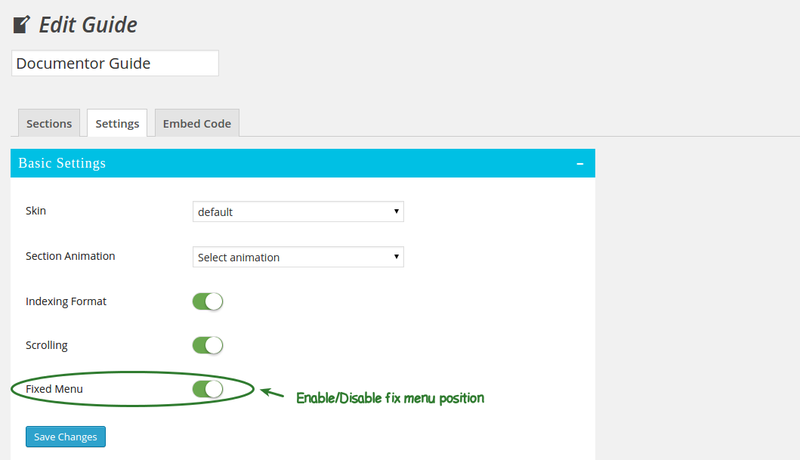 If this option is enabled then rest of setting of nav menu title will not be applied on the frontend. 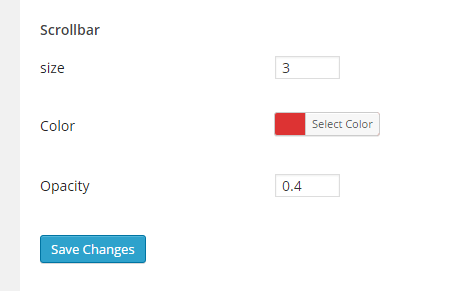 Color: Choose a color from color picker box and save changes. The selected color will get applied to the nav menu title. Font: You can select Regular font, Google font or Custom font from given select box. Depending on your selection below settings fields will get changed. Font size: You can change the font size of the nav menu title. Font Style: You can change the font style of the nav menu title. If you select the Google font option from the font then this field will be hidden. Use theme default: If you enabled this, theme’s background CSS will get applied to the Active nav menu background. Color: Set color to active nav menu background. If “Use theme default” is enabled then this field is not applicable. Use theme default: To use the theme’s CSS to Section Title, you can keep option enable. If this option is enabled then rest of setting of section title will not be applied on the frontend. Color: Choose a color from color picker box and save changes. The selected color will get applied to the section title. Font size: You can change the font size of the section title. Font Style: You can change the font style of the section title. 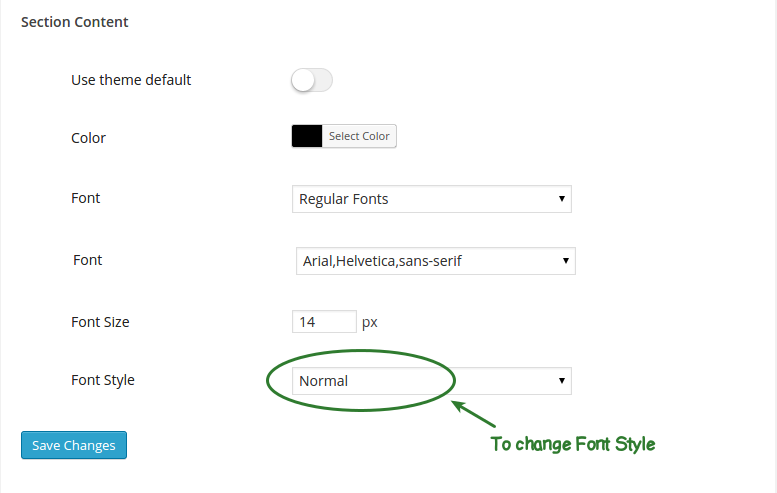 If you have selected Google font from the font option then this field will get hidden. 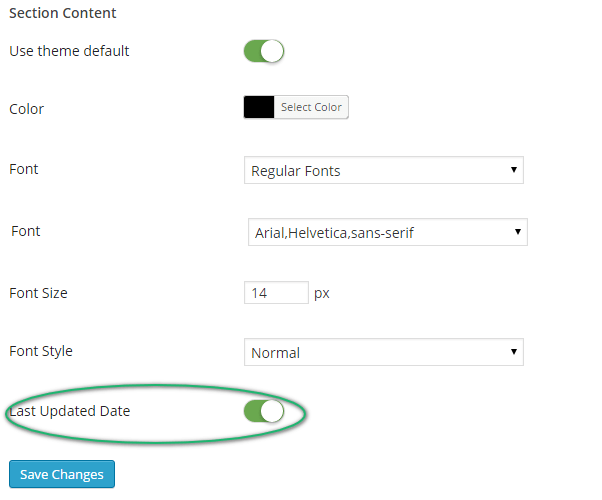 Last Updated Date: It will display the last updated date for each of the section of the guide if it is enabled. Use theme default: To use the theme’s CSS to Section Contents, you can keep option enable. If this option is enabled then rest of setting of section title will not be applied on the frontend. Color: Choose a color from color picker box and save changes. The selected color will get applied to section contents. Font: You can select Regular font, Google font or Custom font from given select box. Depending on your selection below settings fields get changed. Font size: You can change the font size of the section contents. Font Style: You can change the font style of section contents. if you selected google font from font then this field will get hidden. Size: The size of the scroll can be specified from here. Color: The color of the scroll can be selected from the color picker box. 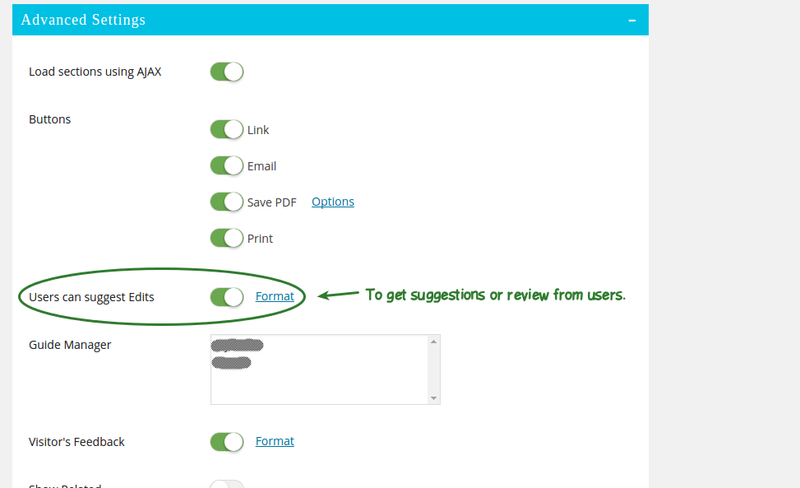 Advance settings provide you an option to enable or disable email, user feedback, PDF and many more. 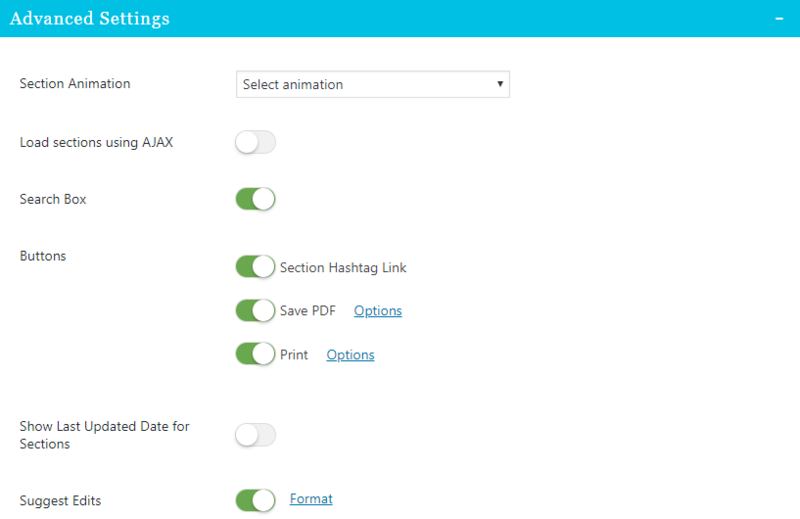 Load Sections using AJAX: If you enable this option only active menu’s contents will get visible through AJAX. Search Box: By enabling this option it will show the search option for the document on the admin panel as well as the front end. Buttons: You can enable or disable these options as per your requirement. 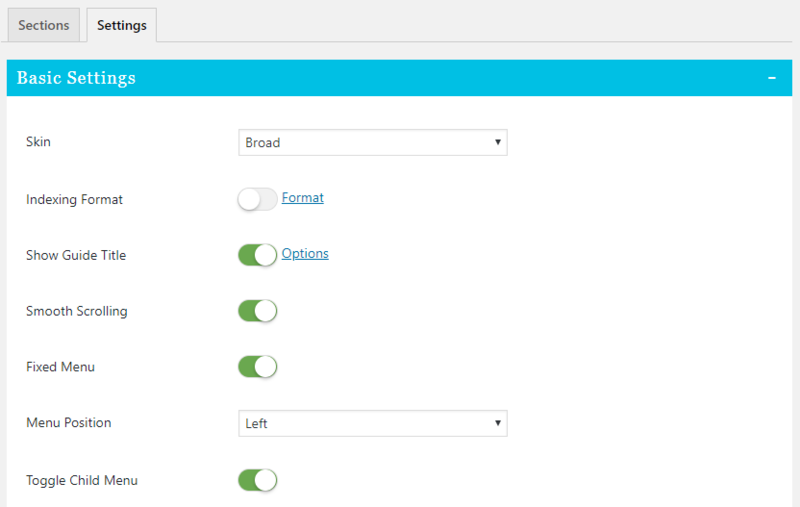 This all options are visible on the frontend of the Documentor. Link: You can get a link of a particular section using this option. Icon of the link appears on the front if it is enabled. Email: This option is visible on the frontend. Using this option user can send mail to document owner. Save PDF: It is to enable or disable the PDF option which is visible on the frontend. 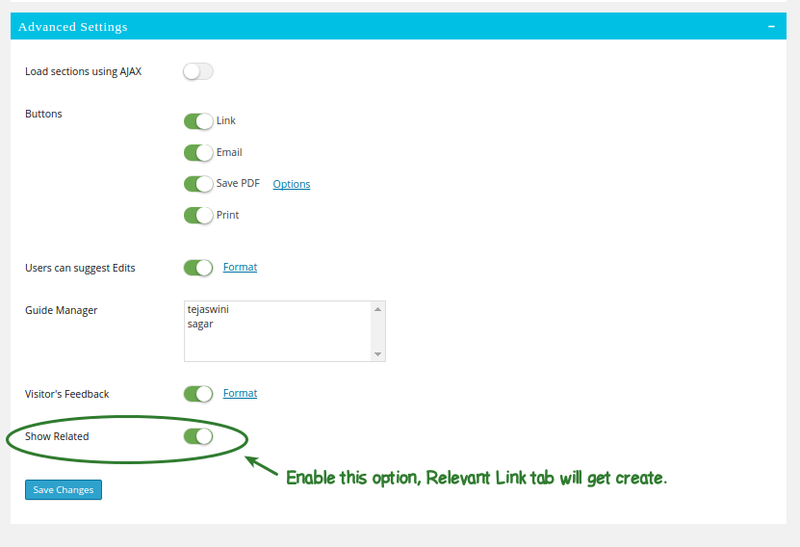 You can set your personalized PDF format using PDF options. Using PDF options you can change font and font size of PDF. Print: Documentor provides a facility to print data directly. On the right side of the guide, you can find the print option if it is enabled. 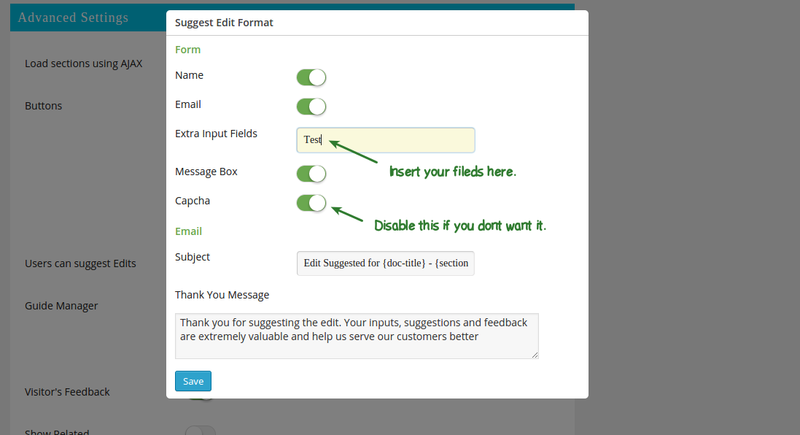 Users can suggest Edits: If you want to hear suggestions for edit from the users, you can enable this option. User’s suggestion will be automatically sent to the guide manager of the document via email. You can choose or set a format for the suggestion box. You can add or remove setting fields. Guide Manager: Select a guide manager. All suggestion edit and feedback email will be sent to the selected guide manager. Visitor’s Feedback: User can submit feedback if you have enabled this option. 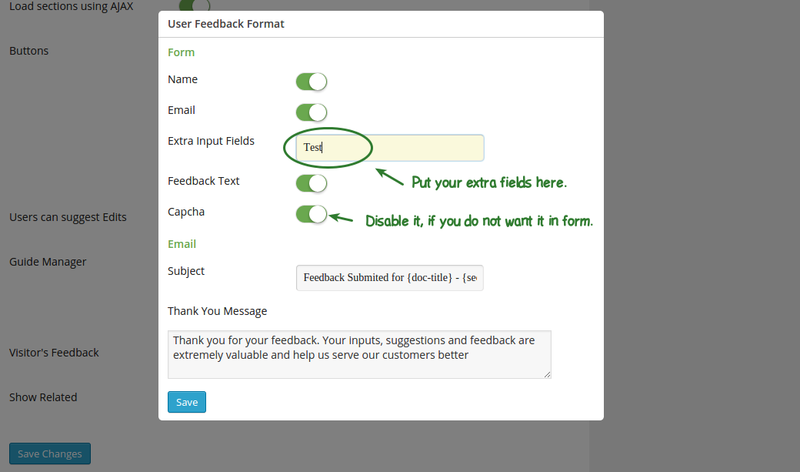 You can set up the format and message for feedback box. Feedback mail will be sent to the guide manager. Feedback Count: If this option is enabled then it will show the feedback count for the document. Related: This option shows related menus. After enabling this option new Related tab appears, where you can choose the menu from selection box to show below Documentor menu on the frontend. 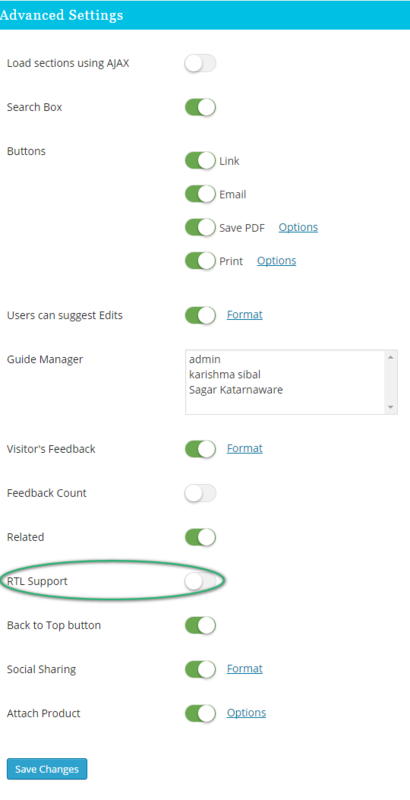 RTL Support: If this option is enabled then, you can read the Documentor guide from right to left. Back to Top button: If this option is enabled then there will be a back to top button present at the bottom of the document that will take you to the top of the document. 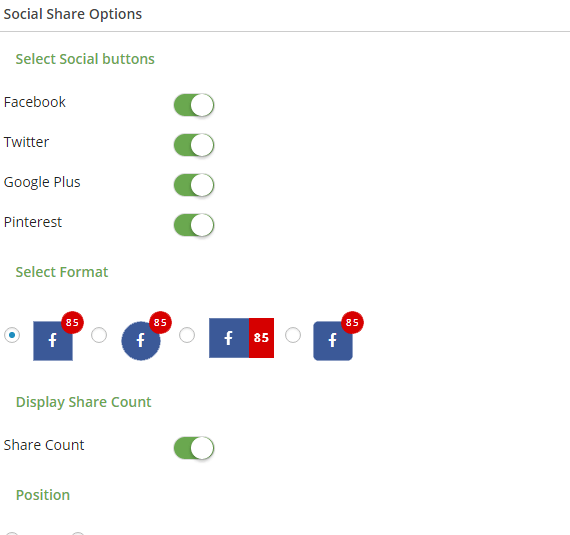 Social Sharing: If this option is enabled then the particular document can be shared through different social media platforms from the frontend. One can also decide the format and position for the social media buttons that should appear on the frontend. Attach Product: If this option is enabled then one will be able to attach a particular product with the document along with the link and other details of the product. You can add any type of data in Documentor, e.g. Images, Videos, Gallery, Graphs and charts, Tables, Maps and many more. To add images into document, Click on “Add Media” button and select image/images to add into section. 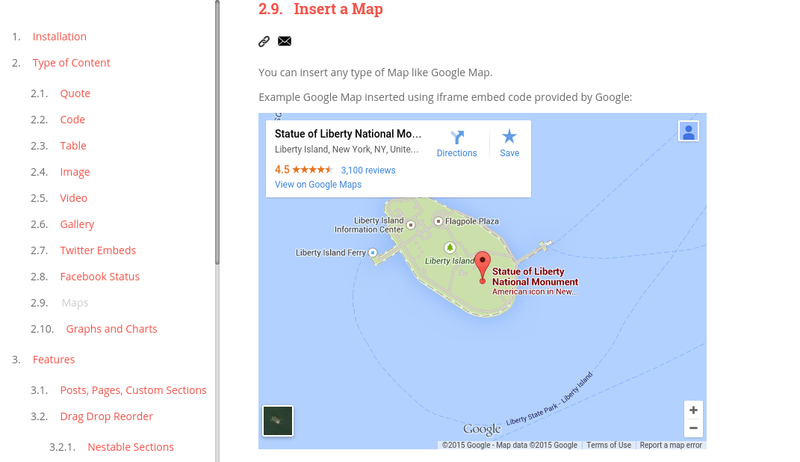 You can insert any type of Map like Google Map. 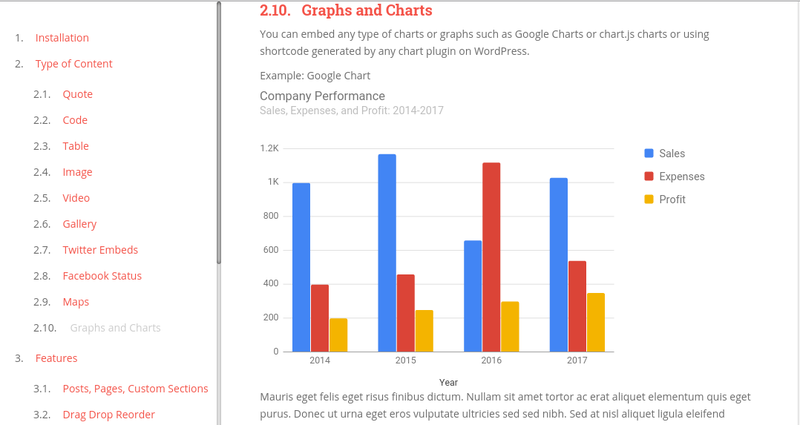 You can embed any type of charts or graphs such as Google Charts or chart.js charts or using shortcode generated by any chart plugin on WordPress. To enable/disable PDF go to Documentor => Manage => Select your document => Edit section => Settings Tab => Advance settings => Buttons => Save PDF. Documentor pro provides you the option to generate PDF. Once you have completed with your section insertion, hit Generate PDF button to generate it. After the successful generation of PDF, a message will get appeared. Every time you make changes to your sections, you have to generate the PDF again. Else the old PDF will get downloaded from the frontend. After PDF generation pdf symbol will appear on the frontend. 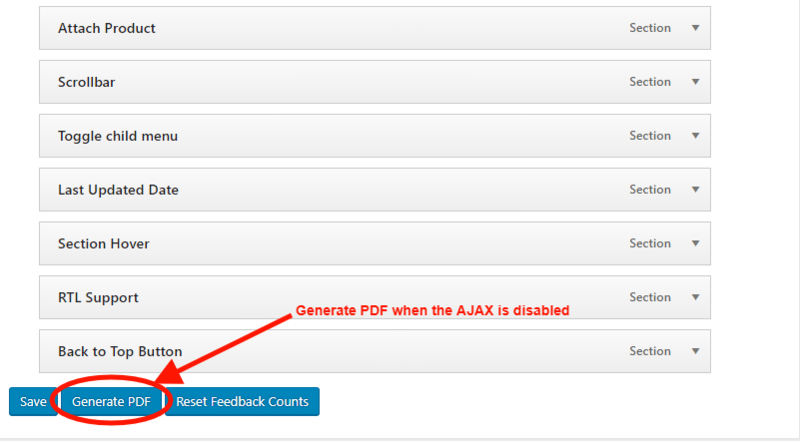 When Loading Sections using AJAX is disabled then you will find Generate PDF button below all section on Edit page. When Loading Sections while the AJAX is enabled then you will find the “Generate PDF” button in the edit window of every section. You need to generate PDF for each section individually. You can find many options regarding the format of PDF file. 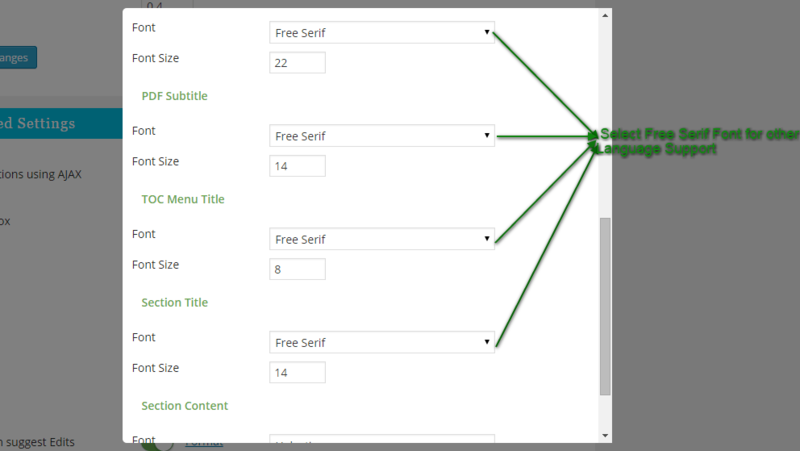 You can change font and font size of each type of content from Header, Footer, Title etc. Documentor pro is WPML compatible. You can generate a PDF file in any language. You need to add sections in your language and generate PDF after insertion is done. Your generated PDF file will get saved and on user end generated PDF file will get downloaded. Before that, you need set font to “free serif” from PDF options to all type of contents e.g PDF title, PDF subtitle, TOC menu title, Section title, Section Contents. You can Preview your guide before embedding it on your website. Go to Admin panel => Documentor => Manage => All created document list will appear => Choose your document and click on preview link, which is available below the document name. In the preview of the document, most of the features are not supported. You can delete a particular guide by clicking on the Delete link. Go to Admin panel => Documentor => Manage => All created document list will appear => Choose your document and click on Delete link, which is available below document name. Your document will get deleted. If you do not want to modify the Default Settings every time a new Guide is created, on the Create Guide Panel you can choose which Guide’s settings you want to inherit. 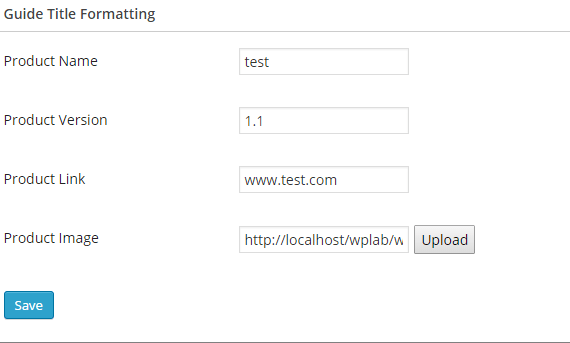 You can import document created on localhost. Go to Admin panel => Documentor => manage => you will find “Import” button on top-right side of a page. => Choose your file and hit import. Yes, Menu title and Section both are different. Menu title appears on the lefthand side of the document i.e, in the navigation panel and section title appears in the content area. 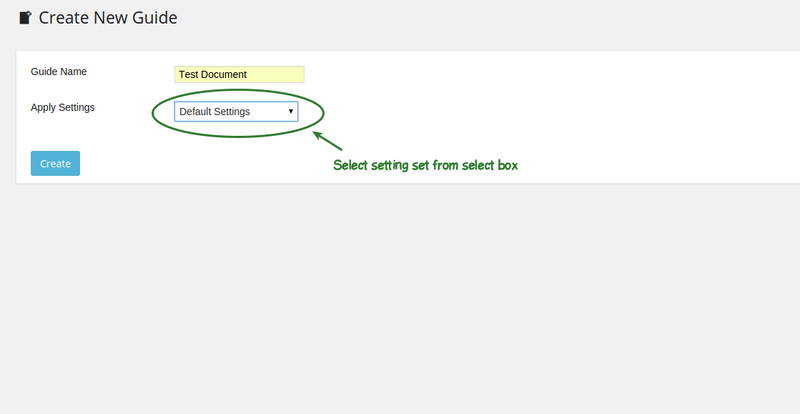 To delete a particular section, Goto Admin Panel >> Documentor >> Manage >> selecting the particular section. When the section will get open you can find the Remove option to delete the particular section from the bottom. Once the changes are done then hit the Save button. Documentor allows you to add external links as a menu. Go to Add section of Documentor, where you can find links section. Put your menu title, respective link and insert section. To open link in new window, enable below “Open in new window” checkbox. To enable go to Admin panel => Documentor => Manage => Edit => Settings => Advance settings => Show Related, enable this option and save changes. After enabling this option new Related tab will appear, where you can choose menu from selection box to show below documentor menu on the frontend. Yes, you can add your existing post or pages, which are already created in WordPress. Go to in Add section, you will find Post and Page tab. using respective tab you can add them. You can also search for your choice of post or page using the search option. The same way the user can also search the content from the frontend that will list out all the related search result for it. Go to Admin panel => Documentor => Manage => Edit => Settings => Basic settings => Indexing Format, disable option and save changes. Your indexing format will not appeared on the frontend. 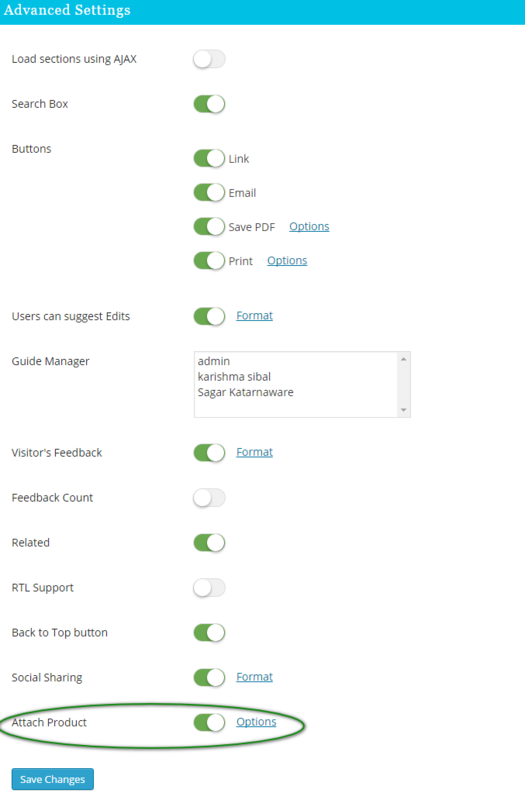 It is easy to disable the scrolling effect in case of Page Guides from: Go to Admin panel => Documentor => Manage => Edit => Settings => Basic settings => Scrolling, disable option and save changes. 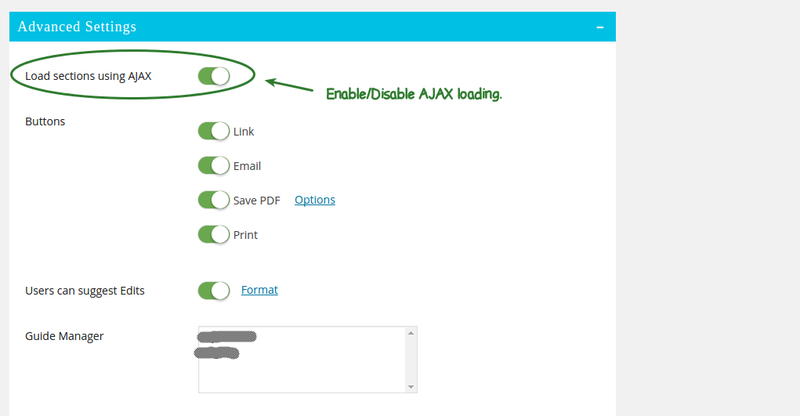 AJAX loading allows you to load contents individually, in small place you can adjust big document. Go to Admin panel => Documentor => Manage => Edit => Settings => Advance settings =>”Load sections using AJAX”, enable this option and the save changes. Go to Admin panel => Documentor => Manage => Edit => Settings => Basic settings => Fixed menu, disable option and save changes. Yes, you can disable it, for user view. Go to Admin panel => Documentor => Manage => Edit => Settings => Advance settings => “Users can suggest Edits”, disable this option and save changes. You can add or remove fields from Suggest Edit form, Go to Admin panel => Documentor => Manage => Edit => Settings => Advance settings => Users can suggest Edits. You will find the Format link. After clicking on that, suggest form template will get open where you can add or remove the fields. You can select guide manager, who can manage all stuff regarding document changes and suggestion mails. Go to Admin panel => Documentor => Manage => Edit => Settings => Advance settings => Visitor’s Feedback. Disable respective option and save changes. On the frontend, the feedback option will not appeared. Yes, you can edit the feedback form. Go to Admin panel => Documentor => Manage => Edit => Settings => Advance settings => Visitor’s Feedback. You will find format link, where you can add or remove fields in the form. 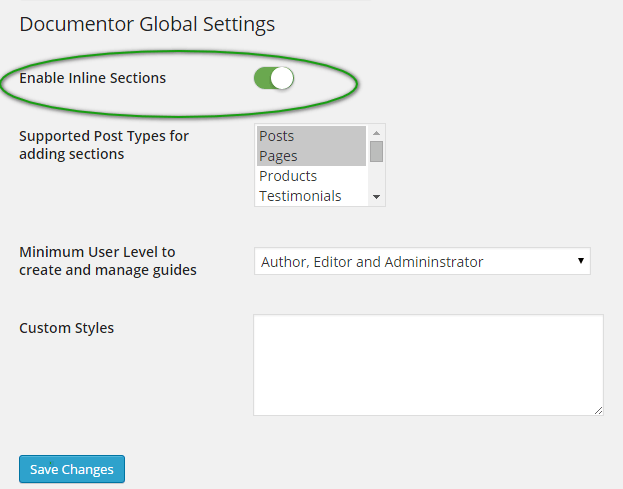 To disable inline section, Go to Admin panel => Documentor => Global setting => Custom post. Disable that option and save changes. Inline section will not appeared in Add sections. 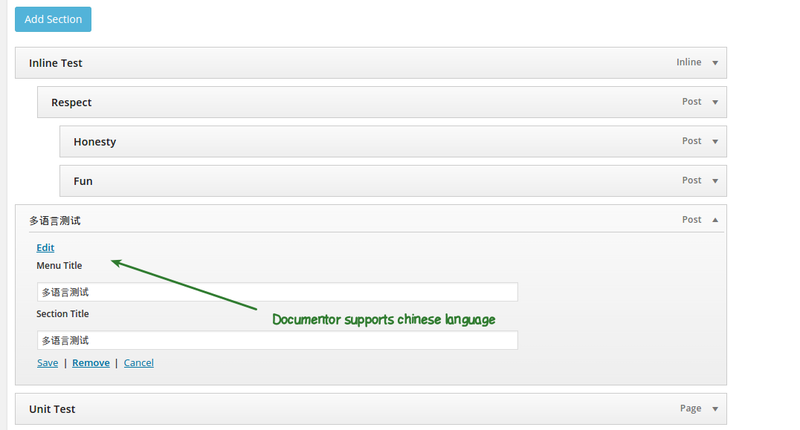 Yes, you can do that go to Admin panel => Documentor => Global Settings. Remove the selection from Posts and Pages from selection box and save changes. 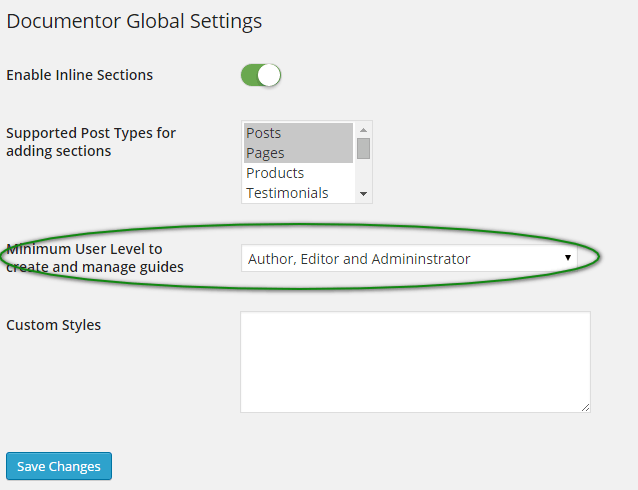 Yes, you can do that go to Admin panel => Documentor => Global settings Custom Posts. Select sections from selection box and save changes. 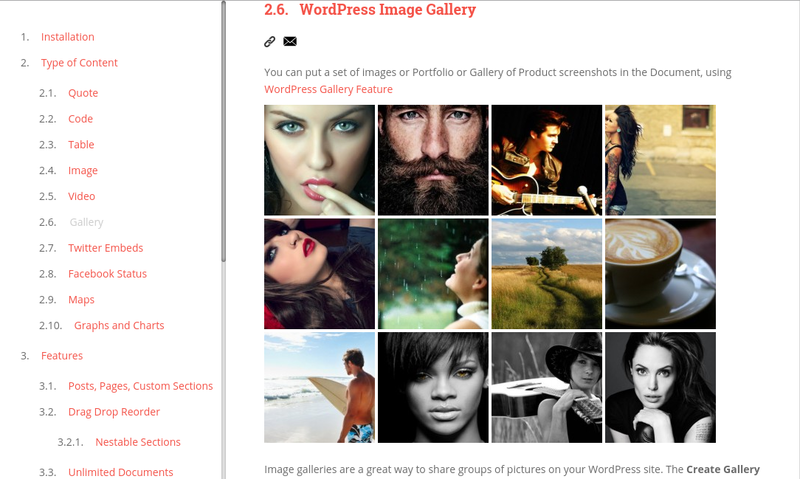 Embed a gallery into guide is same as embed gallery into WordPress posts/pages. You just need to hit “Add media” button and select create gallery option => select your choice images and insert it. Documentor supports video. You can show it on front end. Paste your YouTube video url into section and update section. Videos will automatically appear on front end. Documentor plugin almost supports all types of shortcodes. 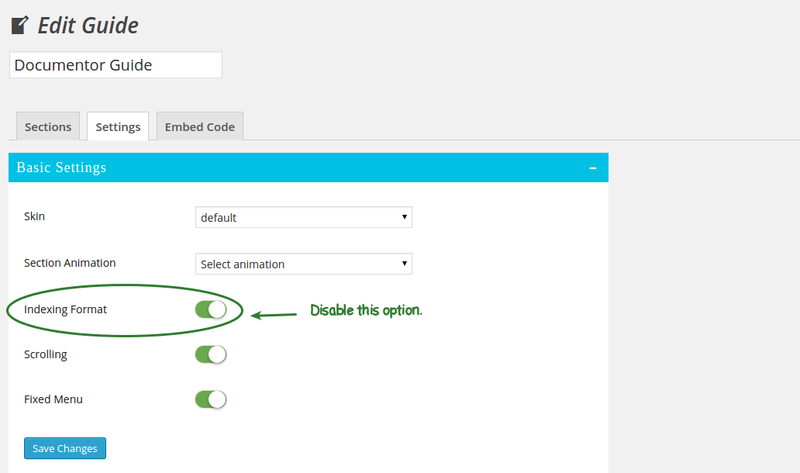 You just need to embed Tabs shortcode into post/page and add that post/page into documentor. You can use WordPress Post Tabs. 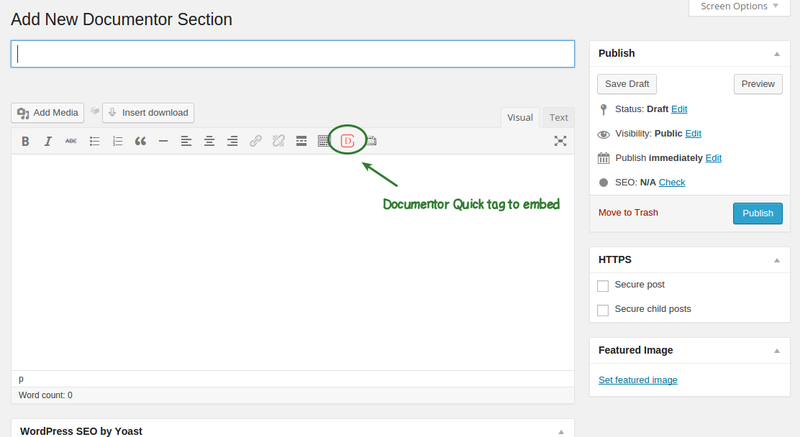 Using Wordress Posts Tabs’s Quick tag user can easily create tabs and paste the shortcode of WordPress Post Tabs inside the Documentor guide and the tabs will start appearing. Almost all the shortcodes will be working when embedded into the Guide. 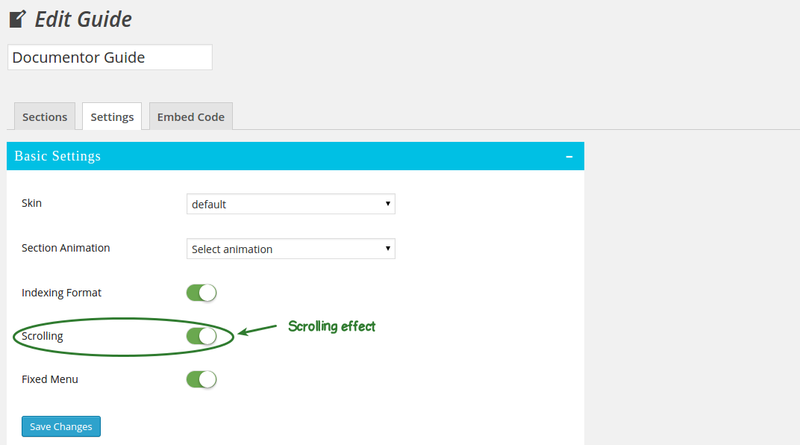 You can directly put shortcode into section and save. 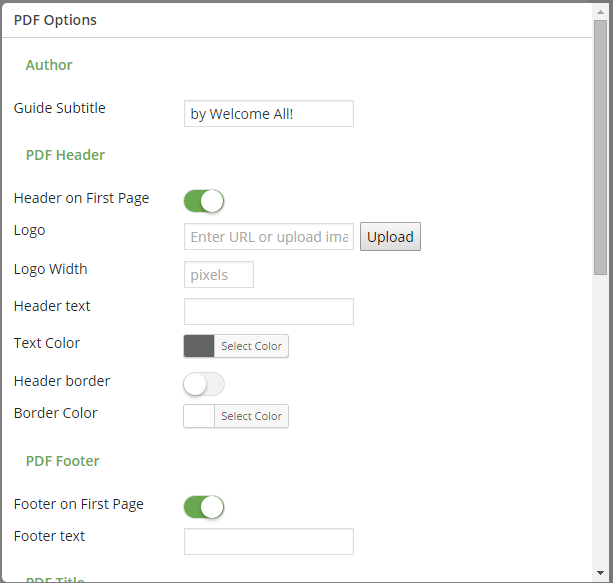 You can change font of PDF file, go to Admin Panel => Manage => Edit => Settings => Advance Settings => Buttons => Save PDF => option. One form will get open, in which you can change font and font size. Documentor supports WPML plugin. You can create PDF in any language. Add Chinese language post/pages into documentor and set PDf font to ‘Free Serif’ from Documentor => Manage => Edit => Settings => Advance Settings => Buttons => PDF options. After that Generate PDF. If AJAX is enable then we will find ‘Generate PDF’ button in each individual section else AJAX is disable then below of sections. Documentor supports WPML plugin. You can create PDF in any language. 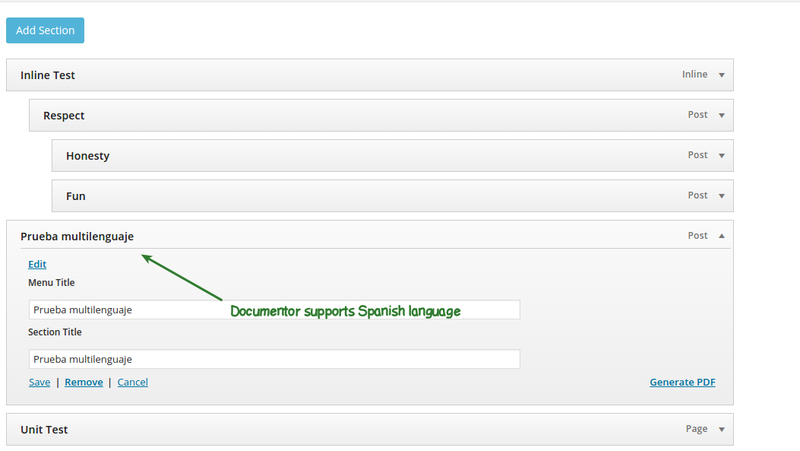 Add Spanish language post/pages into documentor and set PDf font to ‘Free Serif’ from Documentor => Manage => Edit => Settings => Advance Settings => Buttons => PDF options. After that Generate PDF. 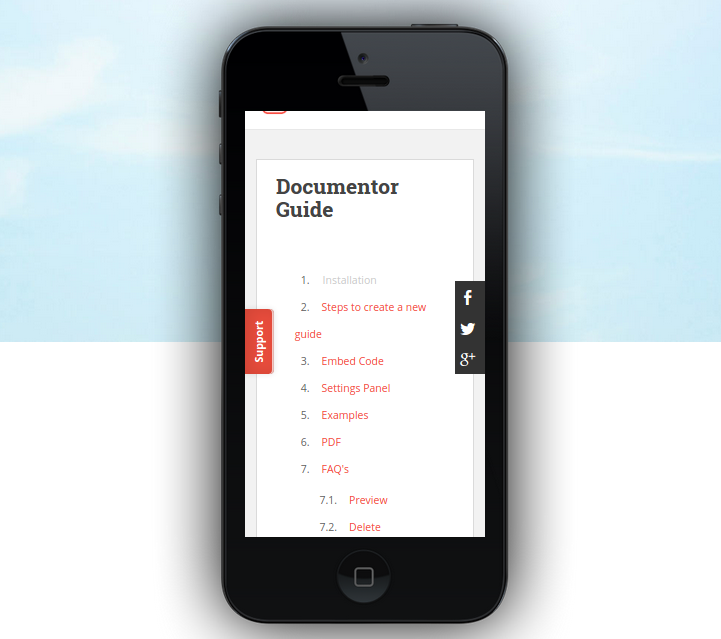 Documentor plugin is responsive. You can open it on any device, e.g. Mobile phones, Tablets and computer monitor. Go to Admin panel => Documentor => Manage => Edit => Settings => Basic settings => Scrolling, disable option and save changes. You can do that with documentor. Go to Admin panel => Documentor => Manage => Edit => Settings => Formatting => Section Contents => Font Style. 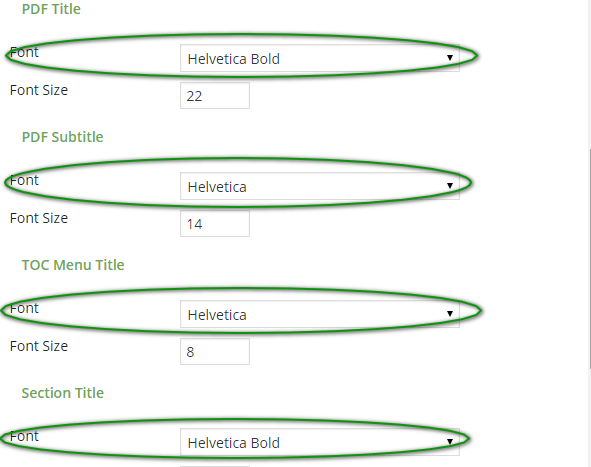 Here you can change font style as per your requirement. If you have selected Google font from Font option then this field will not be there. 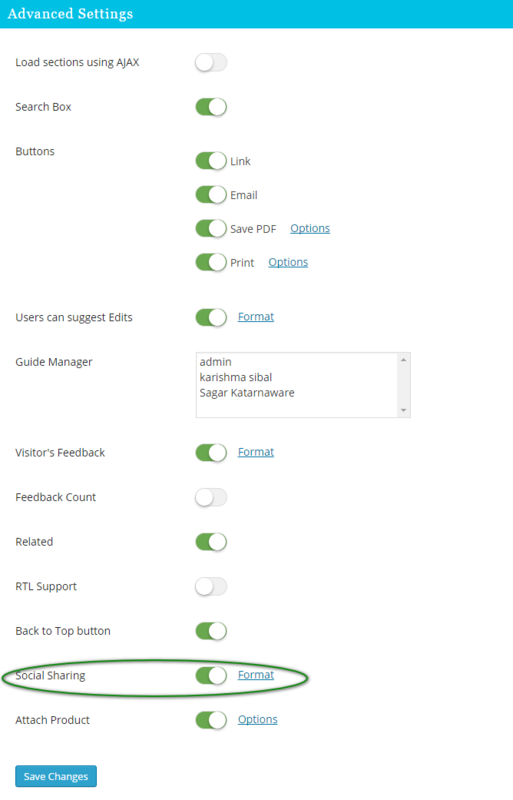 Go to Admin Panel >> Documentor >> Global Settings >> Minimum User Level to create and manage guides >> Select the User from the drop down and save the changes. Goto Admin Panel >> Documentor >> Edit >> Settings >> Basic Settings >> Menu Position. Select the position for the Menu title either to the left or right and then save the changes. 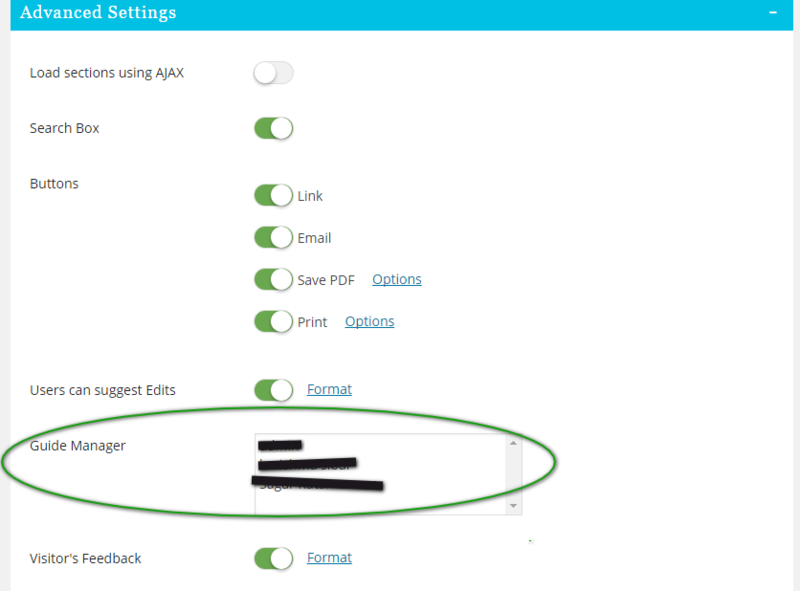 Goto Admin Panel>> Documentor>> Manage>> Edit>> Settings>> Advanced Settings >> Social Sharing. One can also decide the format for social sharing from Format. AlsoÂ one can easily decide the Social Media buttons that are to be displayed, its format and the position where it is to be displayed. Goto Admin Panel >> Documentor >> Manage >> Edit >> Settings >> Advanced Settings >> Attach Product. The format for the product can be decided through Options. One can easily add the Name, Version and other details of the Product. 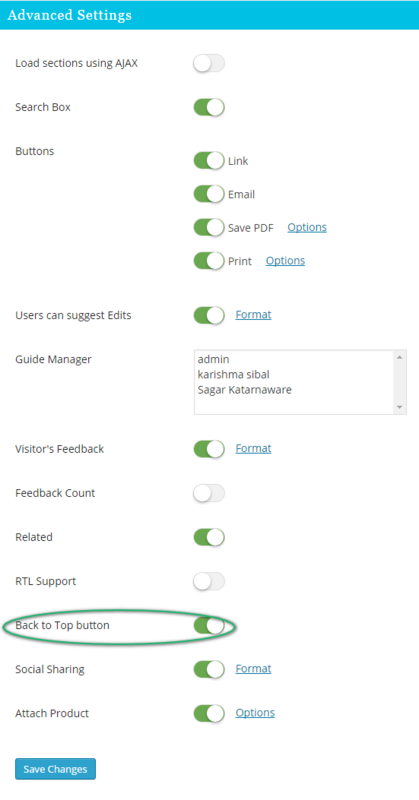 Goto Admin Panel >> Manage >> Edit >> Settings >> Formatting Settings (Scrollbar Section) >> Size/ Color/ Opacity. One can easily change the size and other details of the Scroll bar from here. 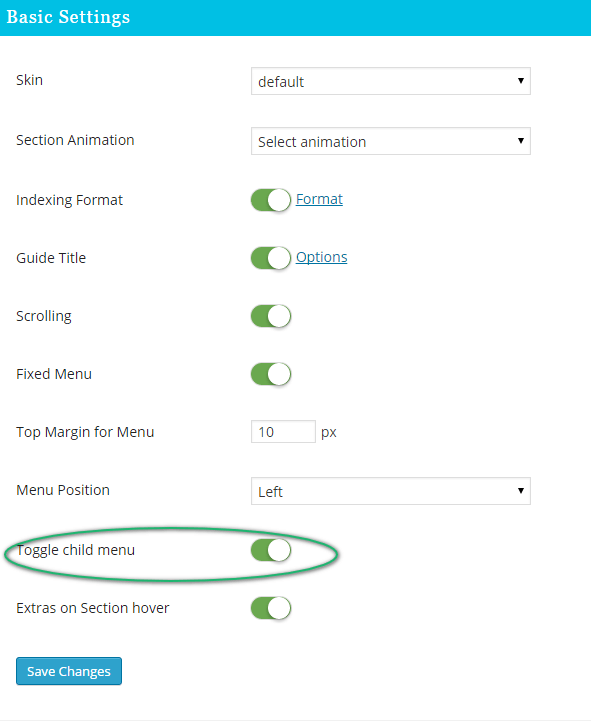 When this setting is enabled then instead of displaying the child section of the guide, it will display the toggle that will display the child menu when it is clicked. 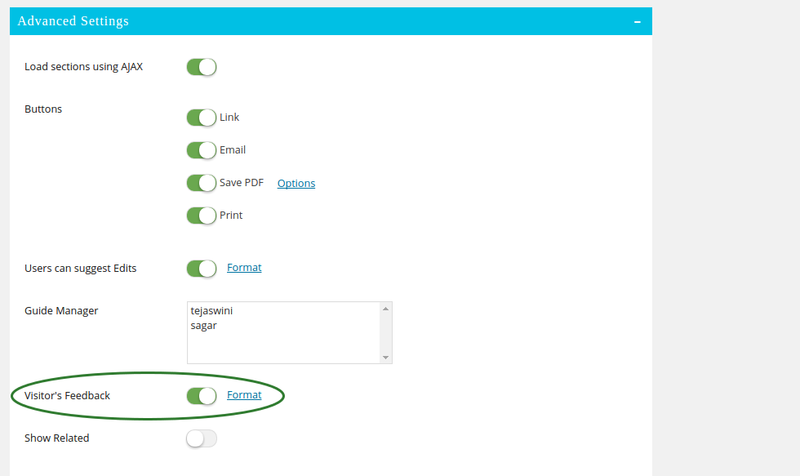 Initially while creating the guide for the document this option is disable but when you want to display the content from Right to Left then this option is to be enabled. When this option is enabled then there will beÂ a button Back to Top at the front end that will directly take you towards the top of the Document that is added.